Eat as many family meals per week as possible, sitting down, with television off. Limit fruit juice to no more than 6 ounces a day. Ideally choose water, milk, or 100% juice over artificially sweetened beverages. Avoiding liquid calories is a good choice for an overweight child; although low-fat milk can still be included as a good lean source of protein and calcium. 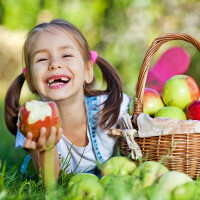 Be a good role model by not bringing too much junk into the house and choosing healthy foods for you as well. Limit TV and video games to no more than 2 hours a day. Don’t put a TV in a child’s room; research has clearly demonstrated that it’s correlated with obesity later in life. When choosing video games, consider dance revolution or games that involve movement. Kids need 60 minutes of physical activity a day for healthy growth, muscle and even brain development! And did you know exercise helps with improving your memory? A serving of fruit can be included at each meal time to help curb sweet cravings and fuel up with a good source of complex carbohydrates and fiber. Fruit consumption is also associated with better overall health. Just wanted to say that this is one of the best sites for Kids of all ages. Keep up the good work! Role modeling, positive relationships with food and family dinners! So important! I think the tip, “Eat as many family meals per week as possible, sitting down, with television off,” is the most important one listed. Our kitchen has a TV in it and my kids would love to have it on during dinner time – but they know it’s off limits. We make it a point to have a “tell me about your day” conversation at dinner. It’s harder for families these days to have sit-down meals, so make a point of it! There are some very good articles on this site and great tips for getting your kids to eat healthy. My daughter is a very picky eater and I do my best with incorporating fruits and vegtables into her meal but there is still a lot of room for improvement. The hardest part is getting her to try something new. I appreciate you passion and your efforts to saving the world one healthy food at a time!